I’m camping this weekend with my daughter. Kind of a Mother’s Day bonding weekend. She’s nearly seven and has just developed some attachment issues as of recently. I’m not sure why she has, but I thought this weekend would help. I live in Ontario. This time of year is pretty chilly at night and completely unpredictable during the day. Last night we bundled under a bunch of blankets, turned on the space heater and hoped for the best. She slept like a log, I laid awake with a cold nose. Tent trailers aren’t really conducive to cold weather camping and nor am I. But I’m willing and wanting to do this. Today it rained and rained and rained. I could feel it in my bones. We made the best of it by playing cards with my parents and getting a fire going for fun before it rained hard. I then had a hot shower at my parents’ house to warm up. Having them only a few minutes from the provincial park is a blessing. Now back at the trailer we have had another fire, listened to some spooky stories on YouTube and had some s’mores. It’s 8pm and I’m pooped. She’s high on s’mores and wanting to play Uno. I think it may possibly still be daylight when I go to bed!! In other news, I got to try out my new BBQ. 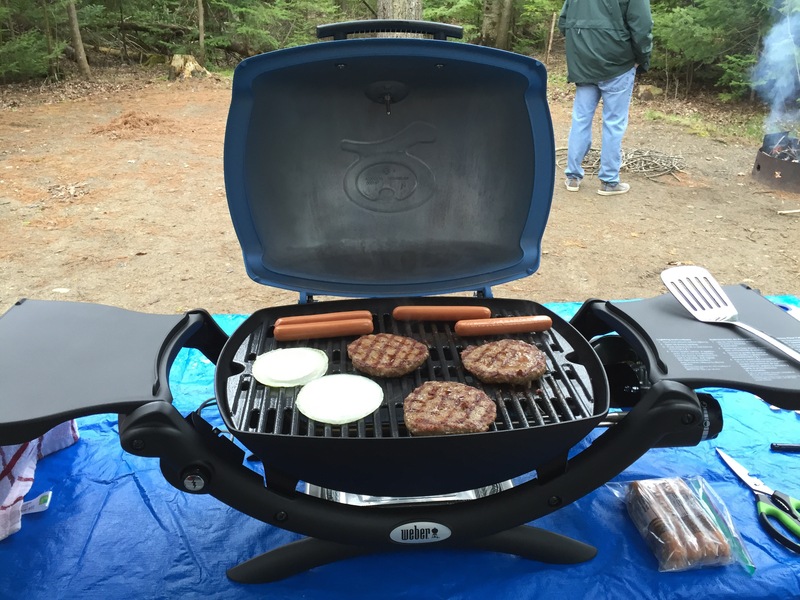 The Weber 1200. So far so good. Easy to put together and can hold a fair amount of food! I miss camping trips with my kids. We use to go camping often in the mountains of Utah.